Recently, astronomers announced the discovery that a star called TRAPPIST-1 is orbited by seven Earth-size planets. Three of the planets reside in the "habitable zone," the region around a star where liquid water is most likely to exist on the surface of a rocky planet. Other potentially habitable worlds have also been discovered in recent years, leaving many people wondering: How do we find out if these planets actually host life? At Caltech, in the Exoplanet Technology Laboratory, or ET Lab, of Associate Professor of Astronomy Dimitri Mawet, researchers have been busy developing a new strategy for scanning exoplanets for biosignatures—signs of life such as oxygen molecules and methane. These chemicals—which don't naturally stick around for long because they bind with other chemicals—are abundant on Earth largely thanks to the living creatures that expel them. Finding both of these chemicals around another planet would be a strong indicator of the presence of life. In two new papers to be published in The Astrophysical Journal and The Astronomical Journal, Mawet's team demonstrates how this new technique, called high-dispersion coronagraphy, could be used to look for extraterrestrial biosignatures with the planned Thirty Meter Telescope (TMT), which, when completed by the late 2020s, will be the world's largest optical telescope. Using theoretical and laboratory models, the researchers show that this technique could detect biosignatures on Earth-like planets around M-dwarf stars, which are smaller and cooler than our sun and the most common type of star in the galaxy. The strategy could also be used on stars like our own sun, using future space telescopes such as NASA's proposed Habitable Exoplanet Imaging Mission (HabEx) and Large UV/Optical/IR Surveyor (LUVOIR). "We've shown this technique works in theory and in the lab, so our next step is to show it works on the sky," says Ji Wang, one of the lead authors on the two new papers and a postdoctoral scholar in the Mawet lab. The team will test the instrumentation on the W. M. Keck Observatory in Hawaii this year or next. The new technique involves three main components: a coronagraph, a set of optical fibers, and a high-resolution spectrometer. Coronagraphs are devices used in telescopes to block or remove starlight so that planets can be imaged. Stars outshine their planets by a few thousand to a few billion times, making the planets difficult to see. Many different types of coronagraphs are in development; for example, Mawet's group recently installed and took initial images with its new vortex coronagraph on the Keck Observatory. Once an image of a planet has been obtained, the next step is to study the planet's atmosphere using a spectrometer, an instrument that breaks apart the planet's light to reveal "fingerprints" of chemicals, such as oxygen and methane. Most coronagraphs work in conjunction with low-resolution spectrometers. Mawet's new technique incorporates a high-resolution spectrometer, which has several advantages. One main advantage is in helping to further sift out the unwanted starlight. With high-resolution spectrometers, the spectral features of a planet are more detailed, making it easier to distinguish and separate the planet's light from the lurking starlight. What this means is that, in Mawet's method, the coronagraph does not have to be as good at sifting out starlight as was thought necessary to characterize Earth-like worlds. "This new technique doesn't require the coronagraph to work as hard, and that's important because we can use current technologies that are already available," says Mawet, who is also a research scientist at the Jet Propulsion Laboratory (JPL), which is managed by Caltech for NASA. "With a high-resolution spectrometer, we can improve the sensitivity of our system by a factor of 100 to 1,000 over current ground-based methods." Another advantage of using high-resolution spectrometers lies in the richness of the data. In addition to providing more detail about the molecular constituents of a planet's atmosphere, these instruments should be able to reveal a planet's rotation rate and provide rough maps of surface features and weather patterns. "It's a long shot, but we might even have the ability to look for continents on candidate Earth-like planets," says Mawet. In the team's design, the coronagraph is connected to the high-resolution spectrometer using a set of optical fibers. Surprisingly, laboratory experiments revealed that the fibers also filter out starlight. "This was completely serendipitous," says Garreth Ruane, co-author on the two new papers and a National Science Foundation postdoctoral fellow in Mawet's group. "It's icing on the cake." Next, the researchers will demonstrate their technique at the Keck Observatory. Although the instrumentation cannot yet study potential Earth-like planets—that will require the larger Thirty Meter Telescope—the system should be able to reveal new details about the atmospheres of larger gas exoplanets, including exotic varieties that are nothing like those in our own solar system. "This new innovation of combining the coronagraph with a high-res spectrometer gives us a clear pathway to ultimately search for life beyond Earth." The first study, titled "Observing Exoplanets with High-Dispersion Coronagraphy. I. The Scientific Potential of Current and Next-Generation Large Ground and Space Telescopes," led by Wang and appearing in The Astronomical Journal, includes Caltech co-authors Mawet, Ruane visiting associate Renyu Hu, and postdoctoral scholar Bjoern Benneke. Richard Dekany. JPL co-authors include James K. Wallace, Gautam Vasisht, Bertrand Mennesson, Elodie Choquet and Eugene Serabyn. Both studies were funded by Caltech, the National Science Foundation, and the Heising-Simons Foundation. Artist's rendering of the future Thirty Meter Telescope. 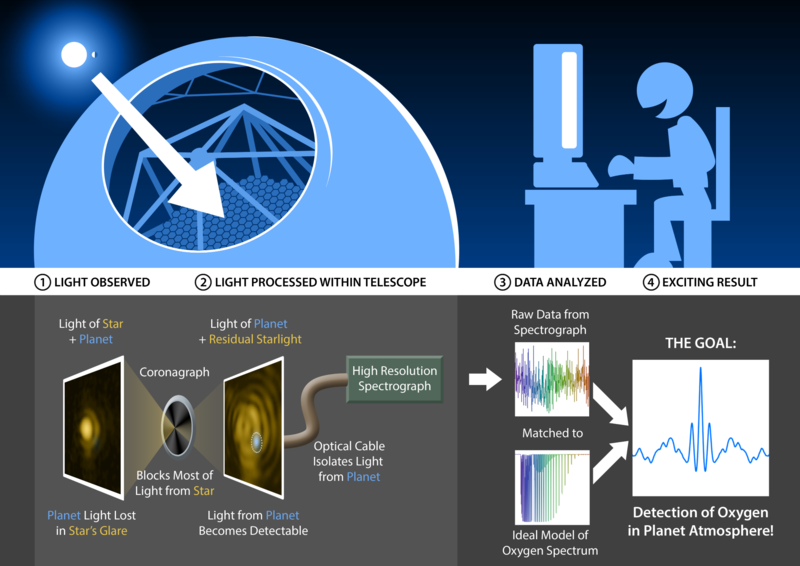 [view full size] Diagram shows how new technology developed at Caltech will work in the future to help astronomers search for molecular biosignatures on exoplanets. Coronagraphs block a star's light, making orbiting planets easier to see. High-resolution spectrometers would help further isolate a planet's light, and could reveal molecules in the planet's atmosphere.